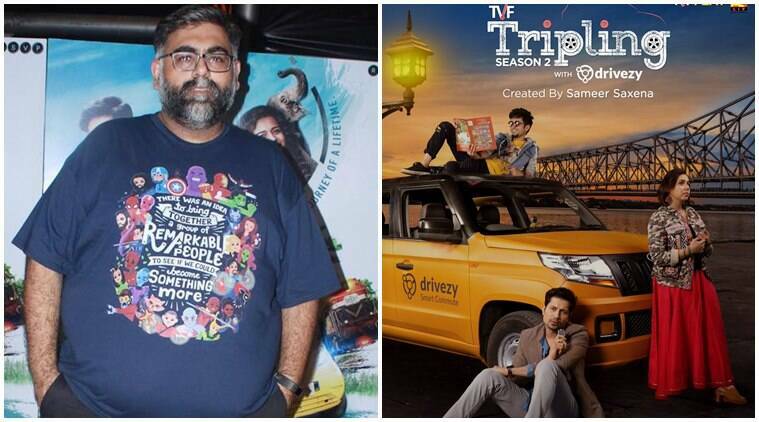 Tripling 2 writer Akarsh Khurana on writing the show, his penchant for road trips and the various acting stints. Akarsh Khurana had also written the first season of Tripling with Sumeet Vyas. Indian entertainment industry has been churning out one web series after the other. TVF’s Tripling is one of those web shows that has received accolades from all quarters. Starring Sumeet Vyas, Amol Parashar and Maangi Gagroo, the show has been directed by Sameer Saxena and penned by Akarsh Khurana and Sumeet Vyas. Akarsh had also written the first season with Sumeet. Recently, he also directed films like High Jack and Karwaan and played the lead role in the show Yeh Meri Family. Akarsh recently sat down for an exclusive conversation with indianexpress.com about writing Tripling 2, his penchant for road trips and various acting stints. What were the emotions while writing Tripling 2? Was it challenging or easier compared to the first time? It was certainly challenging. Honestly, none of us had thought that the series would be loved so much. It was amazing to see Chitvan becoming so popular. We knew we wanted to do a season two but did not want to pressurise ourselves. And this is why we took so long to do this. We knew the chemistry between the trio was working but we didn’t want them to go on a road trip again, just for the sake of it. So we decided to go for a fun story instead. You mentioned that you knew Chitvan had become a popular character. So did that affect the way you wrote season 2, especially his character? The thing that really helped us was that we knew who these three people were. And we tried to be true to that. There was never any extra effort put to make Chitvan funny. Honestly, he is just strange but becomes funny because of the way the other two react to him. Since it was the same people writing him again, it was merely the same character. Recently when we spoke to Sumeet, he shared that he loves writing scenes for Pranav (Kunal Kapoor) most. Who is your favourite to write for? Very interestingly, I like writing for Chandan, Sumeet’s character. I have known Sumeet for 12 years and he is a master of poker-faced comedy. Even when he mouths serious lines, it can sound funny, yet have its own gravity. Chitvan is easier to write since he is totally crazy. And it’s really difficult to write for Chanchal. As a man, we had to be honest to her and write it from a woman’s perspective. As for Chandan, he could easily become very boring but he isn’t. He just reacts to everything around him in a very different way. So yes, I love writing for Sumeet as I know what he is capable of. Co-writing can turn out to be quite tricky. Does your relationship with Sumeet help? Because we had already worked together, this season we had a lot more trust between us. We did not spend a lot of physical time together while writing. We would meet, chat a bit, and since we are friends, it would be all over the place. We now understand each other’s space so we would just jam together a bit and then work on our content. And then we would work on each other’s drafts. After knowing each other for a long time, we now understand each other’s process a lot better. While you have a cameo in Tripling 2, you did a full-fledged role in Yeh Meri Family Hai. Is acting becoming an alternate career for you? No, I am not a very happy actor. I act only when friends ask me to. I am glad I did Yeh Meri Family Hai. It was a learning experience and it also turned out to be so beautiful. But all credit goes to Sameer (Saxena) for this. It was a really brave casting. Sameer had Mona Singh and he could cast anyone. Although I am very different from the character onscreen, I am just overwhelmed by the love I received. I am now a jagat papa (laughs). Your film Karwaan was also about a road trip. As for Karwaan, that’s a route I have travelled a lot. Also, road trips are really a good getaway and give an environment for things to happen. Personally, yes, I like travelling but I hate driving. I would rather take a flight. So can we expect a season 3 of Tripling now? Honestly, we are just hoping that people love Tripling 2. If that happens, we will be happy to write a new season.